The Gallery line of products is by far our best seller. 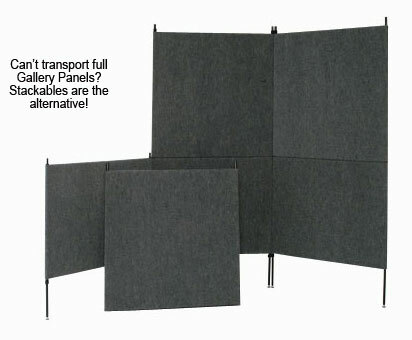 Each panel is 3’ 2” X 7’ and is sold separately allowing you to design a booth that’s affordable and fits your exact needs. No tools are needed and you’ll be hanging your artwork in minutes! Total panel weight is less than 14 pounds. The core is ¾ polystyrene. The frame is welded tubular steel (exposed portions have black thermo plastic sleeve.) Each panel can hold up to 100 pounds distributed weight. Panel is covered with high quality carpet sleeves that are closed at the bottom with hook & loop. Easy to clean with brush and/or vacuum. Any number of panels can be configured any way you want them to. Threaded foot pads provide 1½” adjustment for leveling.